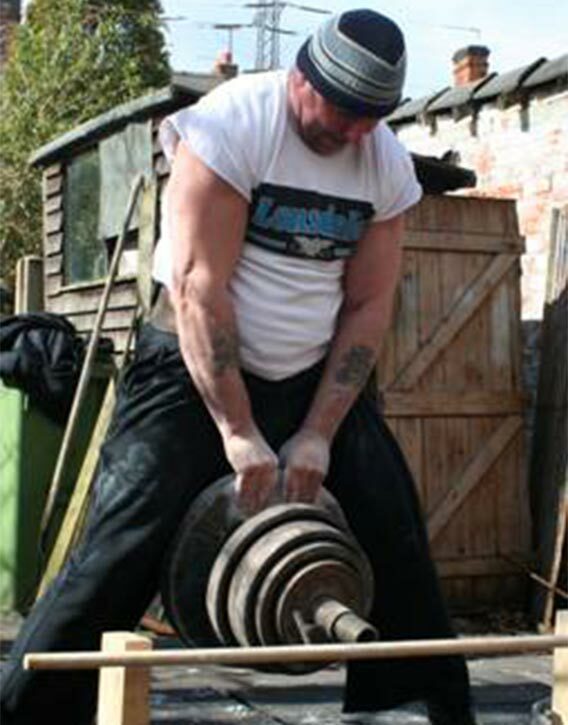 A well-known name in the strength world, David Horne is a man who owns one of the strongest pairs of hands-on Earth. His dedication to building strong hands has led him to be a dominant figure in grip strength competitions. 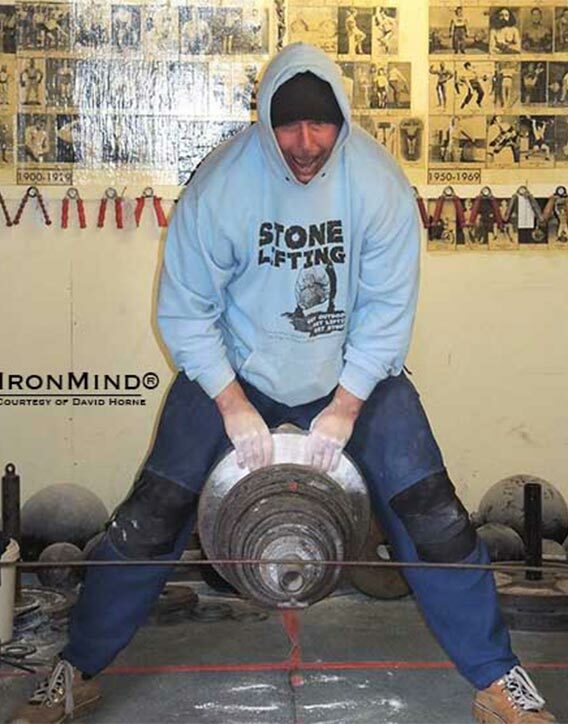 Enjoy reading this informative interview as the down to earth strength legend willingly shares his incredible knowledge and decades of experiences with us. Well hi David. It’s wonderful to be here again at the Grip Factory in Stafford and I’d like to say a big thank you for agreeing to take part in an interview with us. If we could start with your background and how you became interested in training for hand strength and how long have you been competing in grip strength competitions? I suppose I had a natural affinity for it. 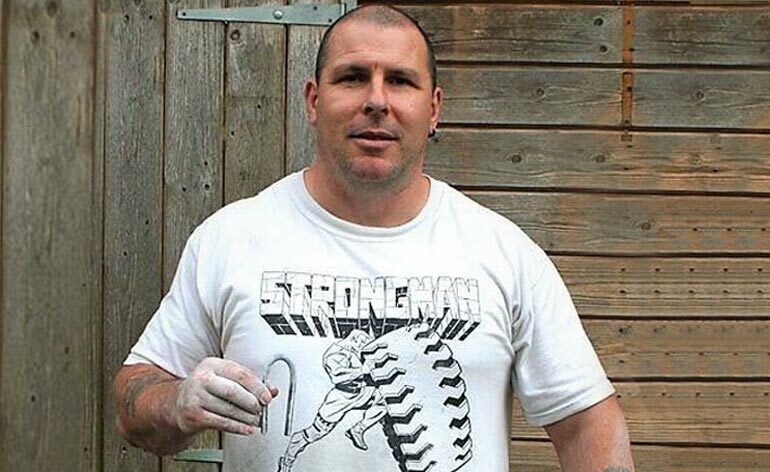 When I left school, I started work as a landscape gardener and I remember being handed a six-inch nail by a couple of the older chaps, one of who was a bodybuilder, and they couldn’t bend it and they said: “could you?” I think I used a rag and bent it very easily. That was at about sixteen or seventeen. It was about 1985 where all of a sudden going out with girls and doing other things, I utilized that and now it was important to start getting strong and competitions started the year after in ‘86 with tug of war. I found that I had a real interest in reading about guys who did grip and I would buy any of the old magazines for articles by David Webster or David Gentle. I started to learn all about that and obviously learning about that I wanted to suddenly see where I stood within this area. At the time, I’m doing tug of war, strongman and all-round weightlifting. I start to put together exercises and start to introduce some of these old exercises into my training programmes. I start to befriend people around the world, the old boys like Bruce White, Ronnie Tait, Peter Lindop and Ben Read. You suddenly start to meet up with these people and learn more all the time. I also started to buy old strength books to learn about the greats in strength, everybody from Sandow to J.C Tolson. In 1991, the first all-round grip competition on the planet is born in Burton-on-Trent. That’s the British Grip Championships which still runs now. From about 1993, I thought “Right, I am going to do grip work nearly every day.” Suddenly, I just ironed out weaknesses galore. Everything just built up significantly in one year. It’s still the same method that I do now, I train grip seven days a week. You’re splitting up the areas. I split up my body parts, currently, it’s deadlifts one session, pressing and benching other sessions, curls on other sessions etc. Even before I do those, I do my grip stuff first. The reason is the grip is more important to me so the grip goes in the beginning when I’m fresh and then I do my other stuff. It obviously works for you David! It’s been a godsend. When I first started landscaping and they handed me a shovel ,I was wrecked! I had shovelled for three days and I thought “this is gonna kill me!” A couple of weeks down the line I got used to it and I was absolutely fine after that. So what happens is your body gets used to it and that’s exactly what I did on the grip. You’ve got to be a little bit clever about it. What we’re saying is doing an arrangement of different grip exercises . A gift from Eddie -a 225kg duck walk! Yeah, using your brain as well. Things don’t always have to be written on a piece of paper. You have to have your foot on the pedal, you have to know when to accelerate and you have to know when to brake. Absolutely! Some of our readers will be unfamiliar with grip strength training. Could you give us some examples of the types of events that happen in grip competitions? The events that happen in grip competitions are also the areas that you really want to train. So you have pinch, that’s where four fingers oppose one and you squash something that’s pretty flat sided together and hold it and lift it. There’s supporting grip. A lot of people who actually have gone to a gym will know what supporting is. It’s holding a barbell or a dumbbell in a supporting grip. Within supporting there is thick bar supporting. There is wrist strength which is an area that is not looked into as much as some of the other areas by the strength community. You have crushing(grip), that’s where you’re crushing a gripper. To join in with those three is endurance. The majority of sports that you’re going to compete in, if you are gassed before we even go, you’re in trouble! The most important thing is to pinch, the most important thing after that is your wrist, after that is your endurance and supporting. In grip contests we test all those areas. Most contests will have a minimum of three events. 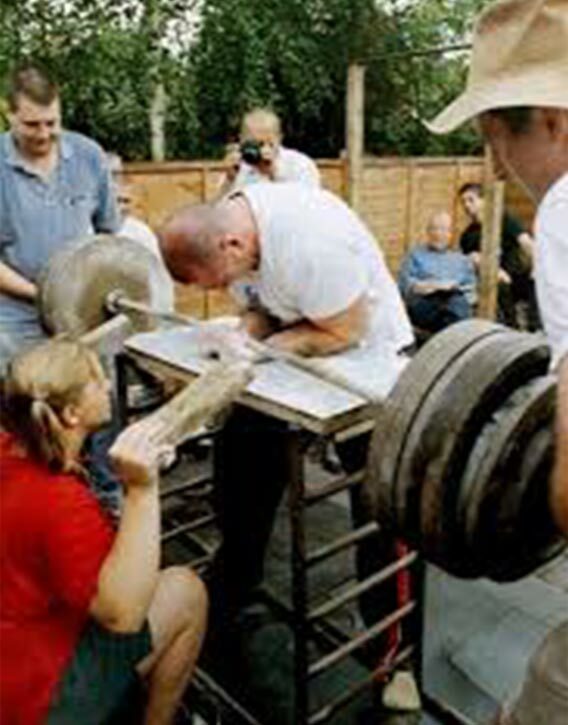 We use reverse strongman scoring so if you had four events and you won all four you would have four points. Do you have any events that you favour? Injuries sometimes now cause issues. I’ve always trained ambidextrous,so you’ll see me do as many events with my left hand as I will with my right hand. I always was more right handed but I have an arm that doesn’t straighten from an accident so that causes an issue. Right from the beginning, I always trained my wrist a lot. I always train my pinch a lot. I suppose those two areas but then again I used to lug heavy one hand lifts off the floor but with an elbow that doesn’t straighten and another one that doesn’t quite straighten it then becomes sore through the joint. When things hurt, you like the other ones that don’t hurt as much. Your objectives change over time. Injuries play a big factor in your decisions what events you favour. I’m 55 and I’ve had a 31 year non-stop career, 300 or so competitions. I remember one of the years I got 28 competitions in the year. If an old man can give anybody advice here, it’s to enjoy your path. The medals, all they become is dusty things sitting in the gym. It’s the memories when you look at them, all the people that still keep in touch with me from the eighties, nineties, noughties. So you’ve made some lifelong friends? Yeah. You meet a lot of people and the majority are really interesting and they bring so much to your life. You’re born and you die and along that path you’ve got to have the interest and there’s nothing more interesting than going to countries and meeting people and just having great times. It makes it worthwhile. It’s obviously far more than just material objects, yeah. Absolutely. I compete in a sport where we earn pennies. So then you have to think, it’s a lot of hours you put in in a gym, a lot of travelling and a lot of things just to get some bits of plastic. It’s got to be more than that, it has to be more than that. 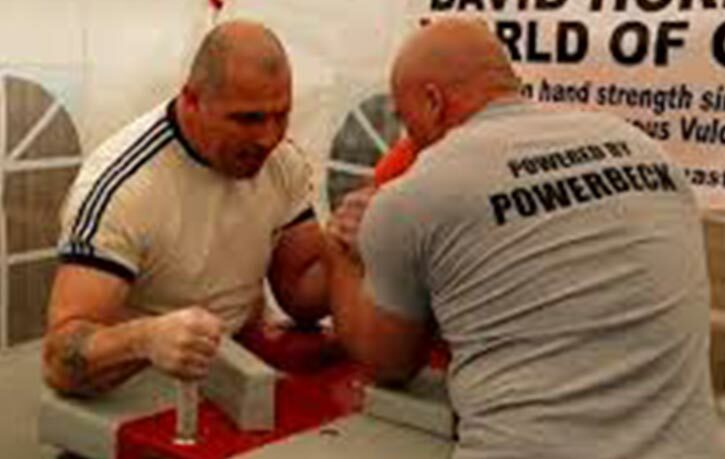 You have a strong background in strength sports such as armwrestling, strongman and powerlifting. Can you give us some of your best numbers in gym lifts and competition lifts? I only ever really count contest lifts. 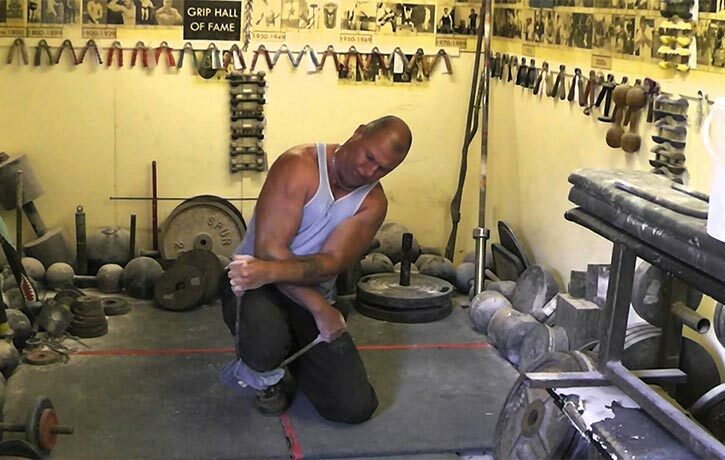 When I did the two hands pinch lift Euro pinch record, which is probably the most hot record in grip, when I worked up to that 122.91kg, I did a 20 week programme. The training for it was superb but I didn’t lift 122.91kg in training. You can end up leaving your big lifts in the gym and thank goodness that’s not been me. I’ve been able to produce a lot of good world records over the time (NOTE: A list of David’s world records can be found on his website). It’s important to get out to competitions because you’ve got to get used to different feels. If you get comfortable in your own little circle, then when you go to something different it clearly feels different. When it feels too different then you can feel like it’s a big imposition upon yourself and you might underperform. It clearly takes a strong mindset to be at the world class level you are at David. Do you use any particular techniques to train your mind, such as visualization? That sounds more airy-fairy than what I really am! We run a competition or go to a competition then we come back and have our notepads and we look at our next thing. So we write out a programme within the first week and it might be brand new, I will have never touched it before in that order. We mosey along for the next 12 or 16 weeks and you’re gaining your technical info. Microscopically, one millimetre one way and one millimetre another way makes a difference. The visualization on the day is just replicating exactly what I’ve already done. I’m not into Valhalla or anything like that! How important is diet for building strong hands? None at all really! If we had a time machine and dropped back to the 1940s,30s or 20s and transported grip competitions to their times, there’d be some guys with strong hands there. Their diet was whatever they could bloody eat! I remember the Oscar Heidenstam Foundation dinners, John Lees (bodybuilder, 1953 Mr Britain) was one of the people talking and somebody asked him about what supplements he used. He said “ I used to have vinegar on my fish and chips.” So I think that answers it! Do you consider supplements to be important for strength? No. I’ve got none. We get plenty of fresh veg, meat, fish and a bit of cheat stuff here and there. I don’t drink alcohol and I don’t smoke. 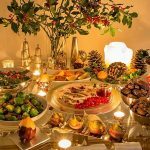 Have you ever played about with vegetarian diets or have you always been a meat eater? I’m not a vegetarian. Maybe people would be a lot more vegetarian if they actually had to kill their own animal. The number of women is increasing in the strength sports. Do you find that there are more women in grip strength comps? This is a new millennium. We arrived at 2000 and Olympic Weightlifting suddenly had women, women being able to do boxing in the Olympic Games, women doing MMA and the UFC. Strongwomen competitions grew. Once women got into the octagon and pummelled each other, there’s no sport that a woman can’t do. Grip sports is growing. We have more women all the time. I’d like to mention to our readers that your wife Elizabeth has got world class grip strength as well. World class grip, world-class strength. A throwing career, all-around weightlifting career, arm wrestling to the highest standard, strong woman to the highest standard, grip and she started Brazilian Jiu Jitsu this year so we’ll see where that goes. Yeah, all sports are demanding once you get to a high level. Technically, they’re super athletes. Fitness wise, they’re super athletes. 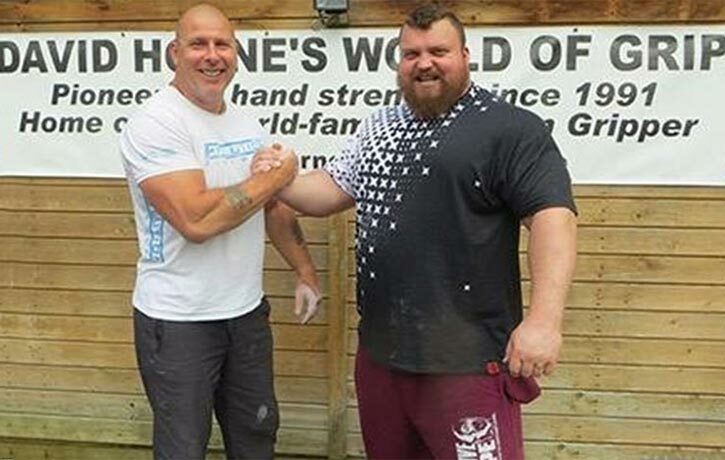 Last year, you had the experience of coaching present World’s Strongest Man Eddie Hall. Can you tell us more about that? He rang me up, he seemed to have some kind of thought that he had a weak grip which clearly he hasn’t. 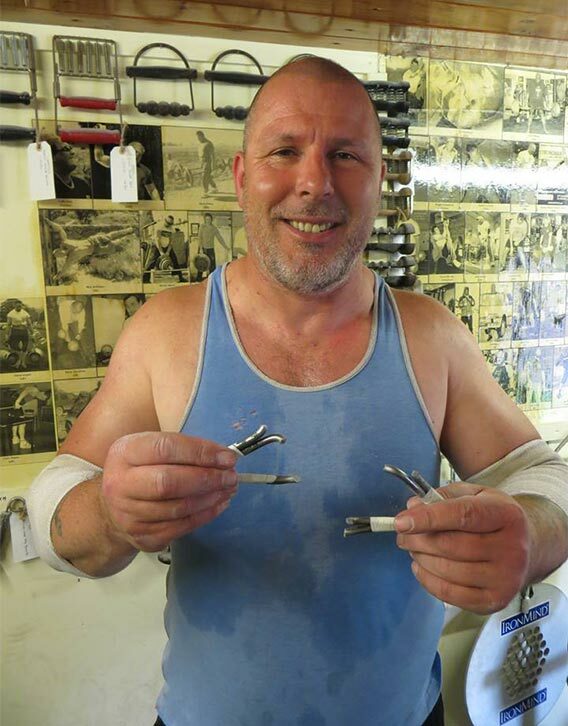 He did a grip competition in Stoke, he’s still got that world record in the Gold Bar pinch lift. Eddie’s a huge guy and has such thickset hands. I showed him very basic stuff. I showed him how to chalk his hands so there was no unchalked part or too much chalk. I gave him exercises that I knew would develop just a little bit more strength and worked his wrists as well. We had a great time, he’s a great fella. 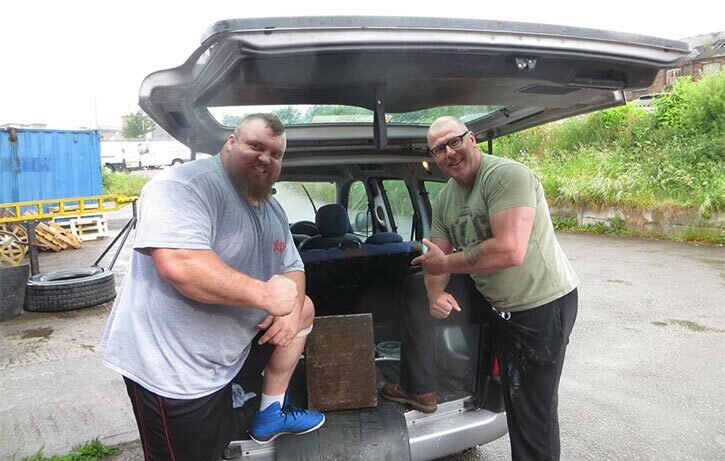 He gave me a 225kg weight from the 2005 World’s Strongest Man with his name signed on it. Eddie’s 500kg deadlift was awesome. What’s the most impressive feat of strength you’ve ever witnessed? Steve Sherwood in 1991 or 1992 going for three times bodyweight one hand deadlift, 70kg doing 210kg. That’s an Olympic bar, 210kg, calibrated plates and he just failed it. I thought it was an incredibly good lift. Three times bodyweight is a massive number even with two hands! 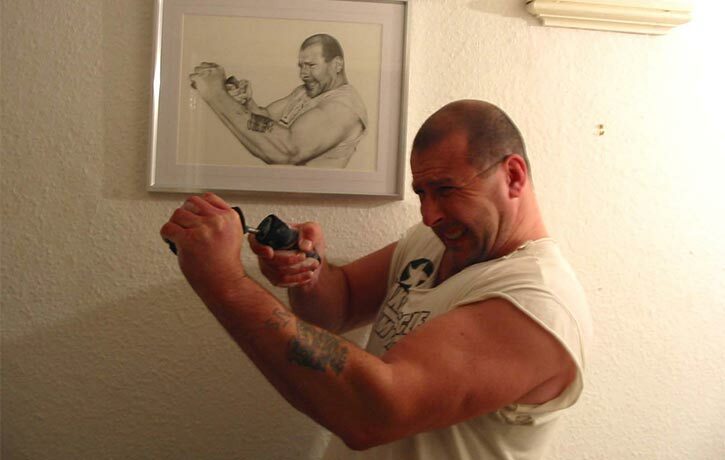 Another one from my all-round weightlifting days was Rick Meldon who was a wonderful all round weightlifter. His technical ability on the one hand swing was second to none. That’s a bodyweight one hand swing on a dumbbell. Those two particular guys have stuck with me, small guys but huge poundages. Do you have any predictions for the future of grip strength sports? I think that by how fast it’s grown, it will grow even quicker. It’s in every country now. Eastern Europe, Russia, Ukraine, America , Canada, all of Europe, Finland, Australia, Korea as well. Exciting things I can see is sponsorships. Companies can make it grow and make it a bit more funky and a bit more exciting. It’s still relatively small compared to something like bodybuilding. Bodybuilding’s been there for decades and decades. Bodybuilding is not growing, in fact, it might be smaller than it’s ever been! Look at other similar sports that are very underground. BMX riding, it’s in the Olympic Games now. Parkour has big championships. MMA, now it’s huge .It (grip) will keep growing because the internet is there so more and more people grow into it. The next avenue or big leap will be a sponsorship deal from a company.Then you get more people knowing about it. That’s the next jump up. Absolutely. We keep playing and putting comps on. The grip tour worked really well these last few years because that brought the sport of grip to powerlifting, strongman, anything. How do you stay motivated? You’ve been training a long time, do you ever feel that your training goes stale or are you always setting goals?Yeah, setting goals. Do you have any grip tips for readers of Keep Fit Kingdom? There’s plenty of grip tips. Bang for buck exercises. The two hand pinch lift. If you haven’t got a Euro pinch, you can put an Olympic bar in the corner and on one end put two flat discs and pinch lift. Secondly, I’m a keen fan of double overhand thumbless (deadlift). It works your wrist and your fingertips. Another one is snapping steel bars, it’s a great fitness exercise. If you want to specialise beyond that, come to our site and ask me some more questions. Where’s the best place for people to get more information about you? David Horne’s World of Grip. We’ve got a shop, we’ve got all the information on contests. You can email me through my site and can also get in touch with me via Facebook. Type in “David Horne” on YouTube for videos there as well. David, it’s been a real pleasure to talk to you and we thank you again for taking part in this interview. Keep up the great work! Excellent. Thank you Alan and I hope everybody enjoys it! We hope you enjoyed this interview with David. Feel free to let us know your thoughts below, join in the conversation on Facebook and follow us on Twitter! 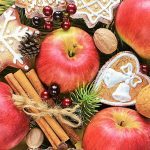 Top 5 Healthy Christmas Foods!